Forbidden Peak, at 8,815 feet is located within the spectacular Boston Basin, the mountain is approached from Cascade River road within the heart of North Cascade National Park. Once in Boston Basin the route leads us across the massive Boston Glacier to the classic West Ridge. The West Ridge route consists of mid-fifth class climbing and 40°-50° snow and ice before joining an exposed rock ridge. The entire region is surrounded by rugged alpine peaks such as Sahale Peak, Boston Peak, Mount Torment, Mount Buckner and beyond. The climb represents the next guided challenge for aspiring alpinist’s interested in honing their skills on more advanced terrain. The classic West Ridge route is considered one of the best moderate alpine route climbs in North Cascades National Park, and is featured as one of the “Fifty Classic Climbs in North America”. The route involves a four-hour hike to high camp, a couple hour climb to the West Ridge notch, and then 8 pitches of 5th class climbing up to 5.6 on the West ridge itself. The best sections of the climb are on the ridge crest, and the entire route features impressive views down the North side of Forbidden to lonely Moraine Lake, as well as the spectacular North Face of Johannesberg Peak, the Quien Sabe Glacier on Sahale Peak, and other peaks in the Cascade Pass area. Trailhead: Boston Basin Climbers Path, 3200 ft. Trail synopsis: From the fork, follow the abandoned road for one mile to the old mine site and continue up the climbers path. Ascend the steep path, with four stream crossings, to treeline at around 5,300 feet. The lower camp is found on the moraine in this area. For the high camp, continue northwest on the climbers path to 6,400 feet. Of the three ridges we guide on Forbidden Peak, the East Ridge offers the most sustained rock climbing. The climb starts with a several hour approach up the ridges and gullies on the east side of the Unnamed Glacier (oddly its name) below Forbidden Peak, and eventually spits you out near the base of the climb on the East Ridge itself. 6-8 pitches of rock up to 5.8 climb along the ridge crest and traverse both the south and north sides of the ridge bypassing several gendarmes and featuring the same magnificent views seen on the West Ridge. This route is usually done as part of a longer stay in Boston Basin. For the descent we use either the West Ridge or the East Ledges descent. The North Ridge is a climb that has it all, a tricky approach over loose Sharkfin Col, a glacier traverse on the massive Boston Glacier ending at the North Ridge, a wild pitch of steep dirt to gain the ridge, and finally 8 pitches of snow or ice up to 50° followed by a thrilling and exposed climb up the low 5th class terrain of the upper North Ridge. The route leads directly to the summit pyramid. This climb is always done in at least three days, with most groups bivouacking at the base of the North Ridge on the first night and then reaching Boston Basin on the second night and the trailhead on the third day. Sits in the middle of the famous Boston Basin. The South East Ridge makes for the perfect introductory alpine rock climb or as an addition to one of the other classic climbs in the area. 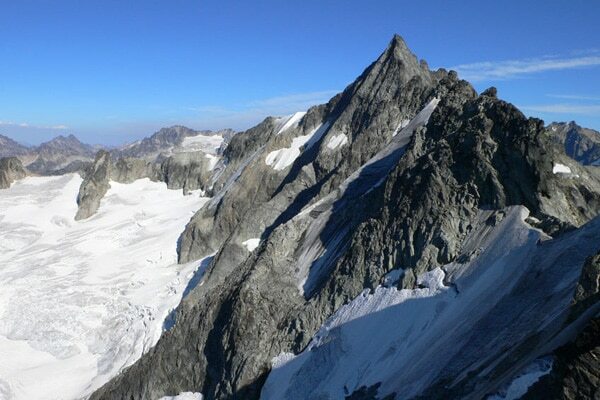 The climb has a good combination of glacier climbing, steep snow, and moderate rock, enabling the climber to put to use many of the skills needed to be a well-rounded Alpinist. Enjoy a Northwest Alpine Guides adventure and summit a beautiful peak in the heart of North Cascades National Park. Climb 5th class alpine rock up the spectacular West Ridge to summit of Forbidden Peak. We lead Forbidden Peak at a 2 to 1 climber to guide ratio ensuring that you receive personal attention and hands-on instruction throughout the climb. Our alpine guides will meet you for team introductions, gear check, and group gear distribution. The drive to Boston Basin trailhead at 3,200 feet takes approximately two hours. The hike to high camp takes 3 to 4 hours. We hike steep forested trail with a series of creek crossings before reaching Boston Basin, once above tree line we climb to high camp located the upper basin below the unnamed pocket glacier that provides access to the West Ridge route. The team will set high camp at 6,400 feet, near the toe of the glacier. We gain 3200 feet from the trailhead to high camp. A one hour skills refresh will be taught after arriving at high camp. Each team member will be assessed throughout the mountaineering instruction. You will need to demonstrate adequate fitness and proficiency in climbing skills as your safely is our priority. We return to camp and prepare for our summit bid. The team enjoys dinner and early to bed for the next day’s climb. Our summit day starts early with a pre-dawn alpine start. From high camp, the climb ascends the moderate Quien Sabe Glacier to the Boston Sahale Col. Our route traverses a rock and snow ridge before reaching the final summit pitch. We scramble third class rock to the summit. After enjoying summit views from Sahale Mountain’s highest point and celebrating our success we rappel our route and descend to high camp. From Boston Basin high camp, we cross the unnamed glacier under the near vertical South Face of Forbidden Peak. We ascend the 500 foot long West Ridge Couloir, we then climb steep 40-50 degree snow, ice and low class rock to the crest of the West Ridge. Climb the exposed ridge on mostly solid rock via ledges and cracks. Difficulties are avoided by traversing on north side of ridge. After enjoying summit views from Forbidden Peak’s highest point and celebrating our success we descend the West Ridge and rappel the couloir to the edge of the glacier and return to high camp. We gain 1,700 feet from high camp to the summit. After enjoying breakfast, we break camp, pack our gear and retrace our hike back to the trailhead. We generally arrive back to the trailhead by early-afternoon and conclude our adventure in Sedro Woolley.